In this wordless picture book, a little girl collects wildflowers while her distracted father pays her little attention. Each flower becomes a gift, and whether the gift is noticed or ignored, both giver and recipient are transformed by their encounter. 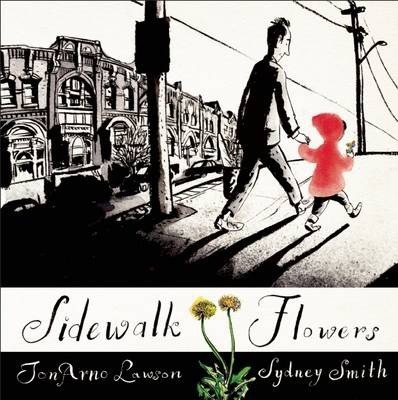 "Written" by award-winning poet JonArno Lawson and brought to life by illustrator Sydney Smith, Sidewalk Flowers is an ode to the importance of small things, small people, and small gestures. "I d give this book to anyone with a coffee table." "New York Times"
"Affecting, efficient, moving, kind. Lawson s done the impossible. He wrote poetry into a book without a single word, and you wouldn t have it any other way." "A Fuse #8 Production"
JonArno Lawson is a three-time winner of the Lion and the Unicorn Award for Excellence in North American Children's Poetry, and the author of numerous books for children and adults, including Enjoy It While It Hurts, Down in the Bottom of the Bottom of the Box, and Think Again. He lives in Toronto with his wife and three children. Sydney Smith was born in rural Nova Scotia, Canada, and has been drawing since an early age. Since graduating from NSCAD University, he has illustrated multiple children's books and he has received awards for his illustrations, including the Lillian Shepard Memorial Award for Excellence in Illustration. He now lives in Toronto and works in a shared studio space in Chinatown where he eats too many bahn mi sandwiches and goes to the library or Art Gallery of Ontario on his breaks.